When you're shopping for college, if you shop carefully, you can make all your college supplies stylish! Just be on the lookout for the right dorm stuff. So when buying college items to keep your dorm and yourself comfy, keep style in mind too. With these dorm Snoozies, it'll be no problem at all. Their great shiny black exterior will add a boost to your dorm decor as you simply walk around your room! While you'll still need other college decorations like a good area rug and some cheap dorm posters, the simple elegance of these Snoozies makes them must haves for college girls. 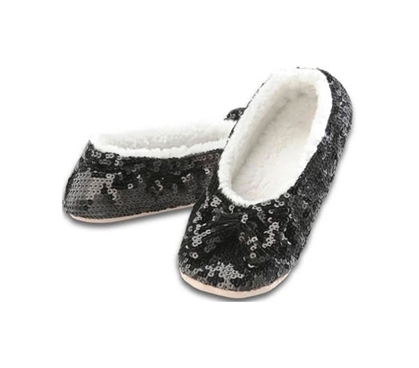 Our Dorm Snoozies - Black Shine are neither slippers nor are socks. They're a crossover foot covering for college girls. They still have a lightly gripped bottom and inner fleece material, so they'll be useful for walking around and for keeping feet warm during colder months! Staying comfy for dorm life isn't an option, at least not if you want to enjoy dorm life. Even if you have a great twin XL blanket to wrap up in, you'll need some foot coverings to stay comfy during college life. With that in mind, there's room for these cheap dorm items on any shopping checklist for college.